Suzie finally decided it was time to get down to business. At 20:00 she was showing the first signs of going into labour and I prepared myself for a late night. By 22:00, you could see the 2 feet and a nose, so luckily the lamb was in the right position. But Suzie seemed to struggle and I tried to give her a bit of help but lubricating the area, she was still quite tight, possibly, because this was her first birth. I managed to get hold of the 2 feet and gently pulled them, when she had a contraction to help and finally another little ewe lamb entered the world. 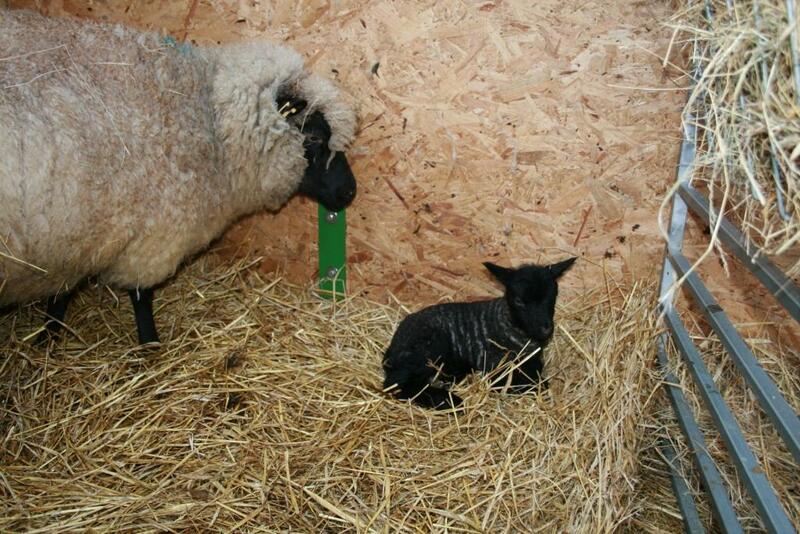 I am so glad I was able to help, luckily watching ‘Lambing Live’ gave me a bit more confidence. Suzie was straight away turning around and started licking her lamb dry. I was then waiting to see, if there was another lamb. About an hour later, the after birth came out, so I knew, that it was only 1 lamb. So in the end I finally got to bed at 3 am, absolutely knackered, but very happy. When I checked on the again a few hours later, both were very well, the lamb was suckling well, knowing she has all the milk for herself. So all in all not bad, 4 ewe lambs and 1 ram lamb.